Early Booking Offer – Book 60 days in advance of your arrival and save up to 40% on your stay. Please contact us for further details. 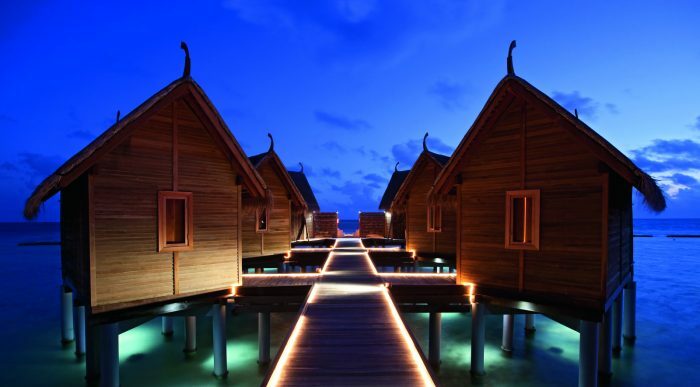 The Constance Moofushi Resort Maldives is an impeccably beautiful spot in the middle of the Indian Ocean. The Maldives is known to be one of the greatest diving spots in the world and the Constance Moofushi, set on its own island, pays homage to that. With villas situated on endless soft beaches or stilts over the azure oceans, your stay will bring you close to the abundant marine life as you feel at one with nature. This is a place where bare feet and a laid-back lifestyle are the order of the day in villas designed to empathise with your natural surroundings, yet with a hint of cosmopolitan chic. Thatched roofs enhance the tropical ambience and in some of the accommodations you can enjoy outdoor showers and baths to really experience the feel of the tropics. Endless days offer the chance to completely unwind or take part in the many activities the resort offers. The beautiful U Spa is a delightfully indulgent place to relax; situated over the crystal waters it offers the perfect holistic experience. After choosing which unique signature treatment you wish to spoil yourself with, you will feel completely refreshed and ready to try the fitness gym, diving or snorkelling experiences. With a choice of two stunning restaurants that cater for children too, your dining experiences will create memories to last a lifetime. Imagine devouring succulent seafood on the beach whilst the sun sets? Or why not enjoy a fine wine from the wine cellar to start the perfect evening. Honeymoon Offer – Stay for your Honeymoon or Wedding Anniversary and your spouse receives up to a 60% discount. Early Booking Offer – Book 60 days in advance of your arrival and save up to 40% on your stay. This charming spa is situated on a wooden jetty over the ocean and also benefits from having a shaded relaxation area. Here you can detox, relax and rejuvenate, the choice is yours. The highly skilled team can help you decide which of their treatments are best suited to your needs. As a guest you will receive a U Spa Experience Card, noting your wellness goals and preferences, which the Spa staff can use to customise your treatments accordingly. Spa care treatments from the Ymalia collection. Located over water, the glass floor panels allow you to watch the colourful fish swimming in the ocean as you enjoy your massage. Swimming pool, infinity edged and curved to mirror the shape of the beach. Diving from the PADI accredited centre. Swim amid mantras, lionfish and eels in the unbelievably clear waters of the atoll. Lessons are available for beginners. Snorkelling equipment is provided by the diving centre to allow swimmers to get wonderful views of the reef and multi-hued marine life. Dhoni Excursions – cruise over the Indian Ocean on a traditional sailing boat to explore the nearby atolls, reefs and islands. Constance Moofushi Maldives is a beautiful resort with idyllic scenery and this property makes for a honeymoon of epic proportions. You can choose your seductive villa to be situated on either the beach or crystal waters; some are located in a secluded spot right at the end of the jetty for 360° views of the sparkling ocean. It doesn’t end there, though. Constance Moofushi offer excursions that make memories for a lifetime; sail together into the sunset and watch the pink-tinged hues of the sky reflect in the tropical waters; the photos you take will amaze your friends and family at home. Snorkelling hand in hand watching the marine life close up is a beautiful experience to share, and Spa Treatments will leave you and your partner rejuvenated and revitalised. Lay side by side enjoying a massage while watching the radiant sea life through the glass flooring of the treatment suite. For a completely unique experience, dine in the buffet restaurant where the floor is made of sand and diners are encouraged to kick off their shoes and enjoy their meal barefoot. Afterwards, stroll down to the Manta bar for exotic cocktails, mocktails and sounds from the DJ which will invite you to dance in each other’s arms under the stars. For creating effortless dining experiences for its guests, Constance Moofushi has refined its culinary delights in two fantastic restaurants. Exploring the world’s gastronomy in natural simplicity heightens your taste buds. Manta is a delight to be enjoyed bare foot. The buffet-style restaurant’s floor is fine white sand complemented by spectacular views over the Indian Ocean. With daily theme changes, each evening offers different world cuisine to tempt you, matched with carefully selected wines to complete your enjoyment. Alizée sits under shady palm trees right on the beach. Grilled fish and the leanest of meats are cooked on the charcoal grill for diners to savour in this laid back atmosphere. Open for breakfast and evening meals, what better spot to start and end your day? Totem Bar is conveniently located next to the swimming pool allowing you to refresh yourself without leaving the beachside atmosphere. Fruit smoothies and snacks such as burgers and sandwiches are prepared freshly from morning to sunset so you can spend the whole day in the sun or take a break under the shade of the trees. Manta Bar Next to the Manta restaurant, this is the place to sit and relax after your meal. Indulge in a beautifully-crafted cocktail, listen to the music under the moonlit sky or dance on the sand for a perfect end to a perfect day.